That the Victoria Miro Gallery is showing its third and largest Francesca Woodman exhibition in a decade is an indication of the growing reputation that the late American photographer holds around the world. Her work has struck a definite chord with a generation of art lovers, collectors and gallery-goers during the three decades that have followed her death in 1981, and has appeared in collections in the Metropolitan Museum of Art, the Whitney Museum and MoMA in New York and the Fondation Cartier pour l’art contemporain in Paris, amongst other institutions. Constant is her nakedness, a series of black and white curves and soft focus shadows. Where her face is in clear view, her expression is one that is lost, yet focused – possessed, even. Viewed posthumously, as only they can be, they hint at her suicide, a grim finality that put a stop to her working life at the age of 22. More commonly, though, these are images that depict abstract, quasi-humanoid forms that are often blurred beyond recognition: split reconstructions of self, obscured by crumbling detritus in the dusty, abandoned locations she favoured. Torso and limbs hug a doorframe in an untitled photograph taken in New York. 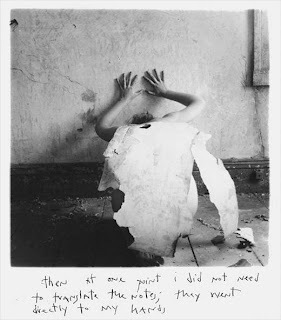 Old, peeling wallpaper frames a navel in one shot from the Space2 series taken on Providence Island, and covers all but her arms and the sides of her crouching form in Then At One Point I Did Not Need To Translate The Notes; They Went Directly To My Hands. The latter title could have been taken from a Kafka fragment, as indeed could the image itself be used to illustrate the Prague writer’s most famous tale, The Metamorphosis, poised, as Woodman appears to be, between transformation and annihilation. They are pictures that could be described as surrealist, but that have a dark, beating heart that make them a more universal prospect, making her work comparable to that of David Lynch. The American director, who ploughs a lone furrow as Hollywood’s only gothic absurdist, described Kafka as “the one artist that I feel could be my brother”. He never mentioned anything about a sister.